How To Hide Your Secret Files Behind An Image:- Yes, you heard it right. You can hide all your secret files behind a harmless looking image file. No one would be able to guess where you have safely hidden all your secret data. This is an amazing trick that you should try today itself. You can even play a little prank on your friends as well. Dive into the article to learn how to hack this amazing trick! First of all, create a folder in your Desktop. 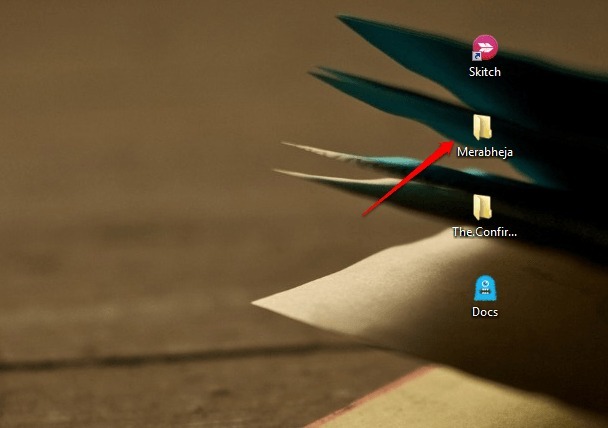 I have created the folder and named it Merabheja. Add all those files into this folder that you want to hide from others. You can add any sort of files including music files, documents, videos, your secret diary etc. I have added some documents to my folder Merabheja. Now you need to compress all these files and make it a single file. For that I have used WinZipper. You can use any compression software of your choice. Another popular compression software is 7-Zip. Give an appropriate name for your zipped file. 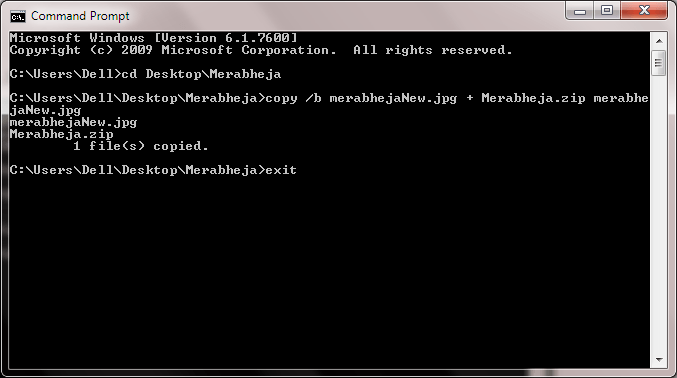 I have given it the name Merabheja.zip. Click on OK button once you are done. As next, choose the image behind which you want all your secret files to be hidden. Move this image to the folder named Merabheja. This image should have .jpg extension. The image that I have selected has the name merabhejaNew.jpg as shown in the screenshot. That’s it. Now you can close this window. 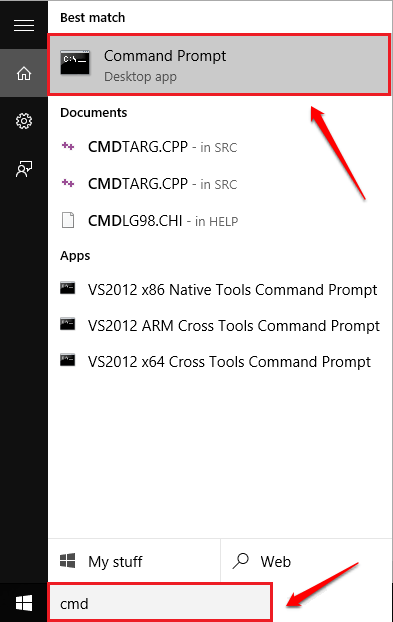 Now, open Command Prompt by typing cmd into your search box and launch it from the results that appear. As next, copy-paste or type in the following commands one by one into your Command Prompt and hit Enter after each command. That’s it. Now you can exit from the Command Prompt by either typing exit or simply by closing it. Refer to the screenshot given below in case you come across any difficulties. Note : It is very important to take care of the special symbols like / and space while entering commands. Now you can get back to the original folder. You can delete all the files including Merabheja.zip. After this step, only the image file , i.e, merabhejaNew.jpg will remain in the Merabheja folder. Now right click on the image file and then choose Open with. Choose a decompression software from the list. 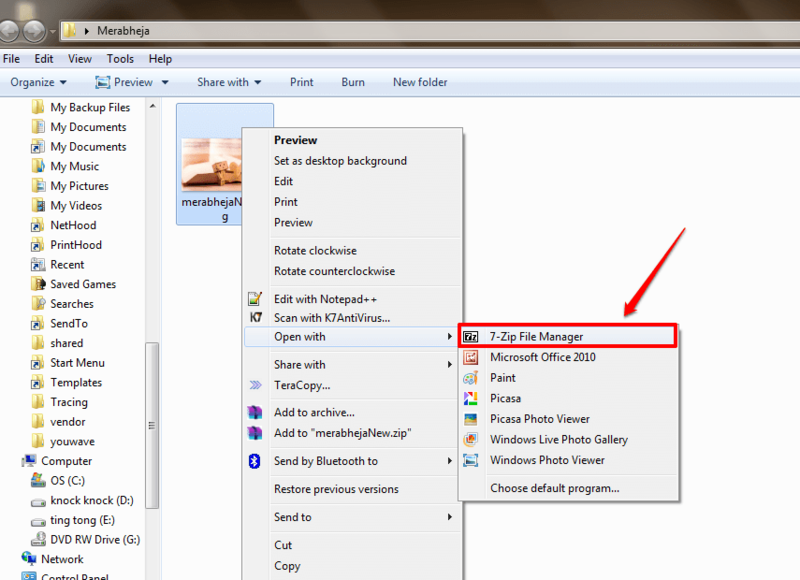 I have chosen 7-Zip File Manager. There you are! 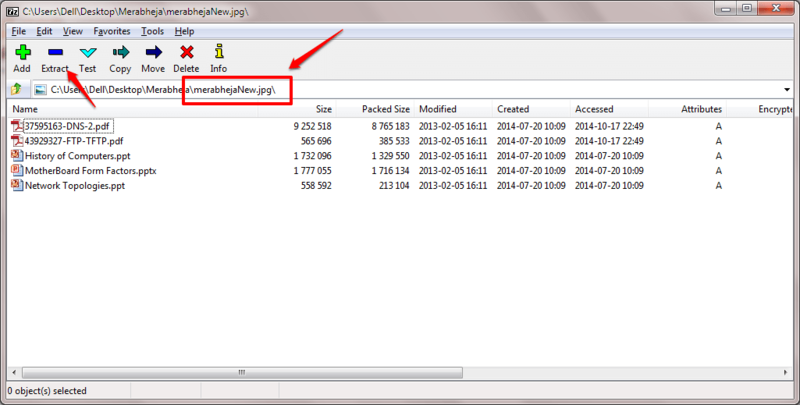 Now you can extract your secret files from your secret image file just like that. 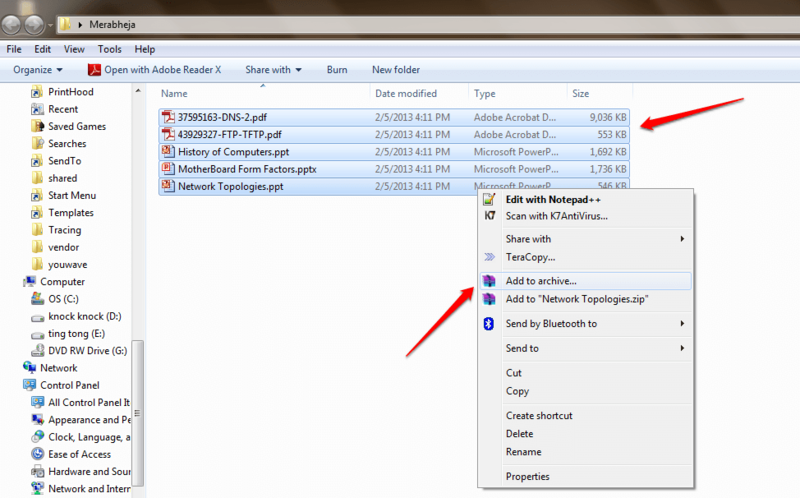 After it is created, you can move the image file containing your secret files to any location as per your choice. You can save it anywhere, though, as no one would guess such a big secret could be lying under a sweet cute image. Feel free to leave comments in case you need assistance with any of the steps. You could also check out our article on the topic Completely Hide A Folder With Single Command Line In Windows. Keep coming back for more tricks, tips and hacks.